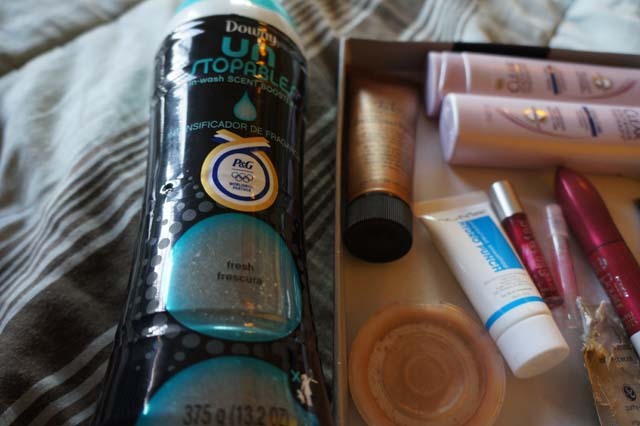 My Made Life - October Empties! That’s quite a lot of products. So brace yourself as each of the items will get a mini synopsis. 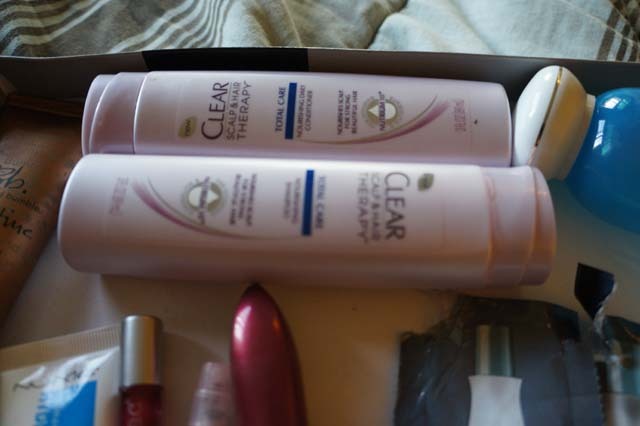 The CLEAR Scalp & Hair Therapy Shampoo and Conditioner was given to me by Influenster. The samples themselves were very generous in size and I was able to get about 2 weeks worth of uses. The idea behind this brand is that healthy hair comes from the scalp. I’ve been using the TRESemme Natural’s Shampoo and Conditioner prior trying this product out and believe that it made my hair feel a whole lot better. I am not so sure though if its the formula that is better or the fact that I switched shampoos that made it feel better. The shampoo and conditioner are reasonably cheap, they retail for $5.99 and was recommended by my friends on YouTube. So I am definitely going to get the full size when I finish my TRESemme shampoo and conditioner. The NuMe conditioning shampoo blew my mind. 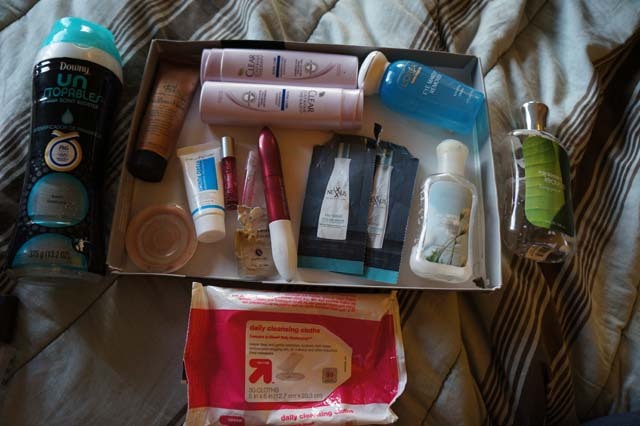 I received the sample through BeautyBox5 and got four uses out of it. It definitely made my hair softer and detangled without conditioner. It contains Seratin-K with is a patented protein which aids the conditioning process. I really like this shampoo but the shampoo alone costs $25 (the shampoo, conditioner and hair mask set costs $80) which is a little pricy for my taste. BeautyBox5 had a coupon for NuMe products but it didn’t apply to the haircare stuff (WTF guys). 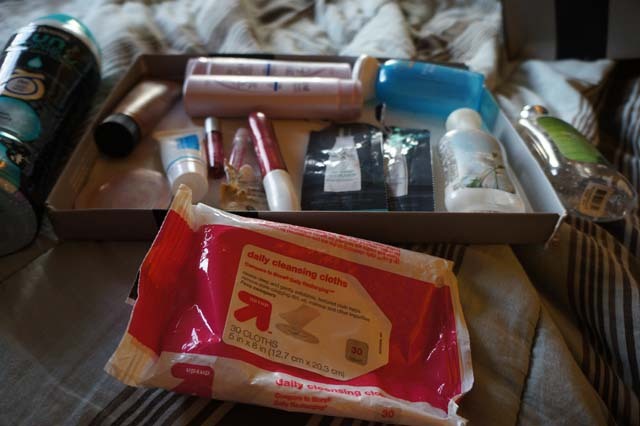 theBalm Stainiac came in my Birchbox and it was worth about one or two months of daily uses. The product applies on really shear and it gives a very natural looking glow. 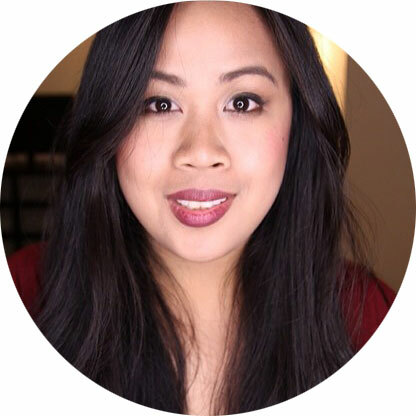 I like it and it inspired me to do my own diy cheek tint (more on that another day). I also finished the Juicy Couture Viva La Juicy Le Fleur perfume sample from my Birchbox and got about a weeks worth of uses from it. Its a very pretty scent; its not to overpowering and it doesn’t leave me with a headache. I am definitely wanting to purchase it or have it on my holiday wish list. The WEI buffing beads are really cool. They turn your favorite facial cleanser into an exfoliating scrub. The beads are really fine and it leaves your skin looking impeccably even after one use. This is great for those who have irritable skin and are sensitive to various facial cleanser since you won’t have to change cleansers for an exfoliating treatment. I am sure that these beads are ground up pomegranate seeds, now if I can figure out how to do that on my own without buying it…. The E.L.F. Clarifying Pressed Powder is one of my favorite low-end beauty products. It costs $1 and it has pretty good coverage for a powder. It’s very compact so it goes follows me everywhere. The L’oreal Double Extend Mascara has been my all-time favorite mascara for the longest time. It’s conveniently packaged with a primer in one end and the mascara on the other. I think out of the duo, the primer is my favorite part and I could live without the mascara. (I am currently trying out other mascaras.) The fact that its packaged as a pair makes priming and coating lashes cakewalk. 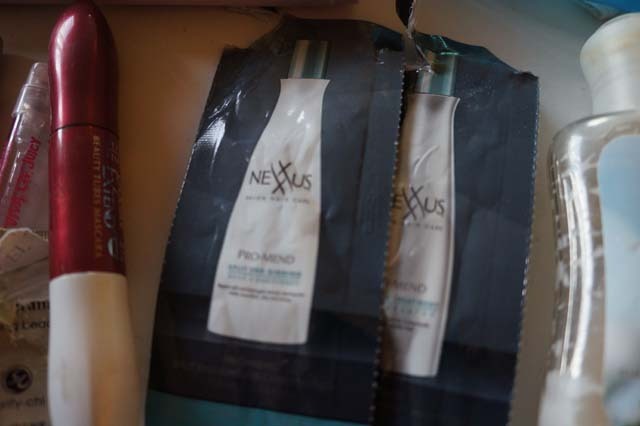 The Nexxus Pro-Mend Split End Shampoo and Conditioner came in my Birchbox and was a one-time use sample (boo). It definitely made my hair ends feel softer but I am pretty sure its because it contains coconut oil in it as you can tell by the smell (and ingredient list). Thanks for the sample Birchbox as I know that I won’t be buying it in the near future. The Bumble and Bumble Brilliantine (brown tube at the top of the picture) was my first high end hair product. Its somewhat of a hair balm and it is used to give your hair that piece-y slept in look. I’ve talked about this in my Most-Worn Summer tag and have finished the product as we went into the fall season. It helps me maintain that effortless bed-head look (as you know the bed head look without any hair product lasts only until lunch time, afterwards it just looks like a clusterf*ck). I don’t know of any low-end products that do the same thing, but if you do know, please share! Downey Unstoppables is a scent booster for your laundry. It definitely boosts the smell for your clothes and makes it last longer than normal detergent. I use it for my bedsheets so that it can smell nice for more than a week. Clothes hanging in my closet keep smelling fresh for about three to four weeks with this product. And most of all, it removes most of that awful thrift store smell out of my thrifted items within one wash. You could also use it with your exercise clothes to remove that nasty B.O. 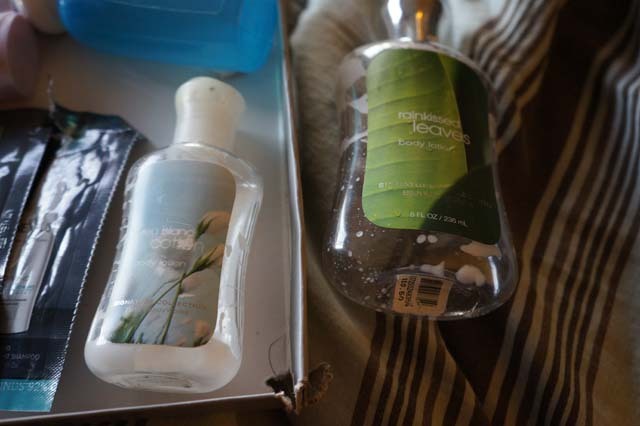 I have been hooked on Bath and Body Works products since I was in middle school when my cousin worked for the store. I love their lotions as it absorbs into my skin quickly and their body washes as it lathers a lot with such little product. The two scents that I have finished are the Sea Island Cotton (which smells like fresh laundy, so comforting) and Rain Kissed Leaves (which is a nice plant-based scent alternative to florals). 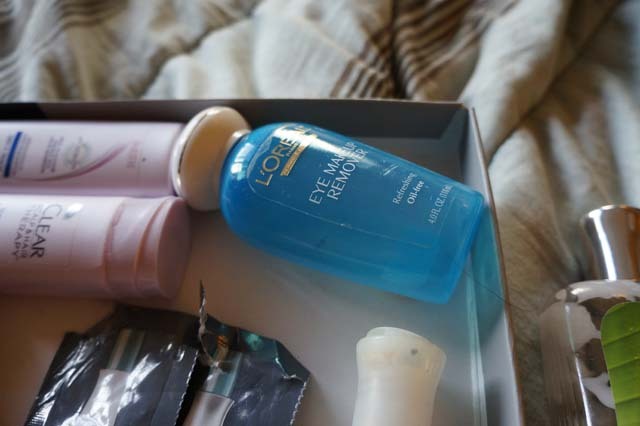 The L’oreal Oil-Free Eye Makeup Remover took FOREVER for me to finish. I love that its non-greasy and doesn’t leave my face looking sloppy when its time to remove makeup. 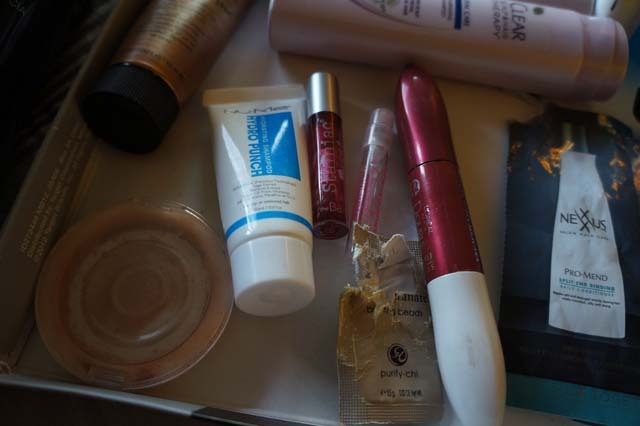 The container has a wide opening that welcomes cotton swabs for removing smeared eyeliner. There’s a good chance that I am going to go back to it after I finish my Boots Botanics Moss Eye Makeup Remover. Last but not least, I finished my Target brand daily cleansing cloths. It is super cheap; I don’t remember the price but it was under $10 for a two-pack of 60 cloths. I wished I had a picture of the individual cloths, but they are textured and I feel like it grabs on makeup really well. I am definitely going to re-purchase in my next Target run.